Preheat oven to 350 degrees. Line the bottom of a 9-inch x 13-inch x 2-inch pan. Butter and flour pan ; shake out excess flour. Set aside. In the bowl of a mixer cream the butter until creamy. Gradually add the sugar and beat until light. Scrape down the bowl. On medium speed , add the eggs one at a time beating well after each addition. Beat in the lemon zest and juice until blended. Reduce the speed and add flour in thirds , alternating with the milk, just until blended. Place batter into prepared pan and spread evenly. Give pan a good whack on counter. Bake for about 30-35 minutes or until cake springs bake when lightly touched in the center. Combine all the ingredients in small saucepan. Place over medium heat and cook until sugar has dissolved. Remove from heat and allow to cool completely. In a saucepan, whisk together the egg yolks and sugar until well combined. Whisk in the lemon juice. Stir in the lemon zest and butter. Place pan over medium heat, stirring constantly. Stir until custard coats the back of of spoon and leaves a path on the back when finger is drawn across. Remove from heat and place in bowl. Cover top with plastic wrap to prevent a skin from forming. Allow to cool completely. In the bowl of a stand mixer beat all the ingredients until light and fluffy. Using a toothpick, poke holes all over the cake. 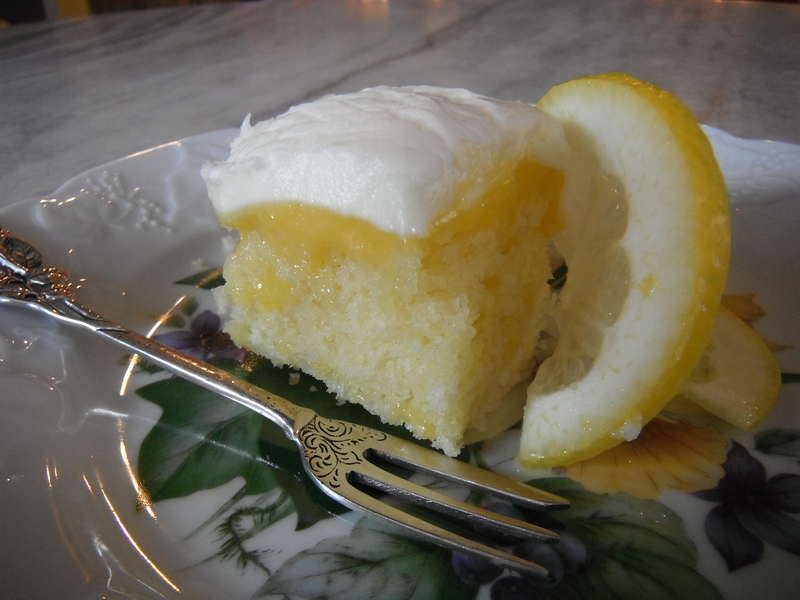 With a pastry brush, brush the cooled lemon syrup over the top of the cake. Spread the cooled lemon curd on top of the glazed cake. Place the cake in the refrigerator until lemon curd has firmed up. Once lemon curd is firmed up, carefully spread the frosting on top. Return frosted cake to the refrigerator for at least one hour. Cut into squares. Preheat oven to 350 degrees. Line 2 muffin pans with 24 liners, set aside. Combine the flour, baking powder and salt in a small bowl and whisk to combine. In a bowl of a stand mixer cream together the butter, sugar and zest until light and fluffy. Add the vanilla and almond extracts to the milk. Add the flour and milk in thirds to the creamed butter mixture ending with the milk. Fold in the fresh berries. Scoop evenly into the lined tins. 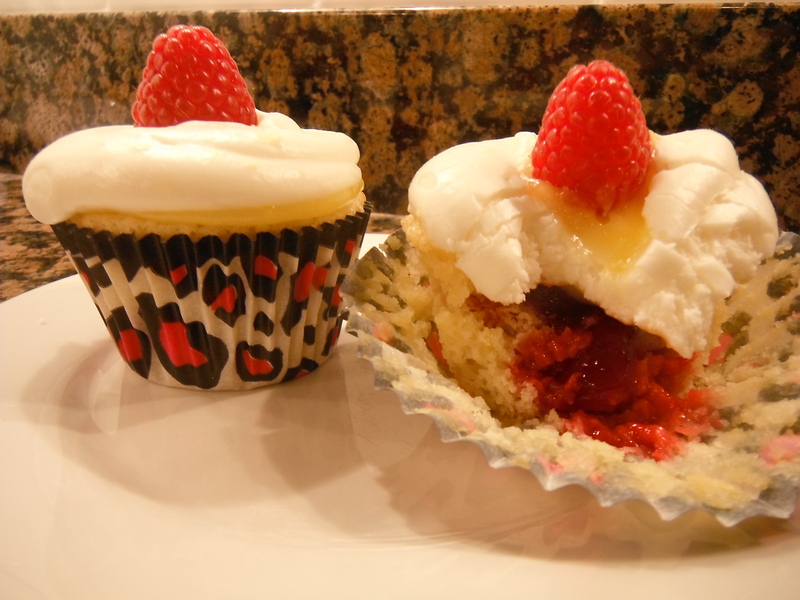 Bake for about 18-24 minutes or until toothpick comes clean when inserted into the cupcake. Remove from the oven and pans and allow cupcakes to cool completely. Begin preparing the raspberry filling. In a saucepan combine the raspberries, water, sugar and lemon juice. Bring to boil and simmer until berries have broken down, about 15-20 minutes. Remove from heat and pour mixture into a fine mesh sieve. Pres the mixture through the sieve until just seeds are left. Return strained mixture to saucepan and whisk in the water/cornstarch mixture. Bring mixture to a boil and simmer for 5 minutes, stirring constantly. Remove from heat and stir in almond extract; allow to cool completely. It will become very thick as it cools. 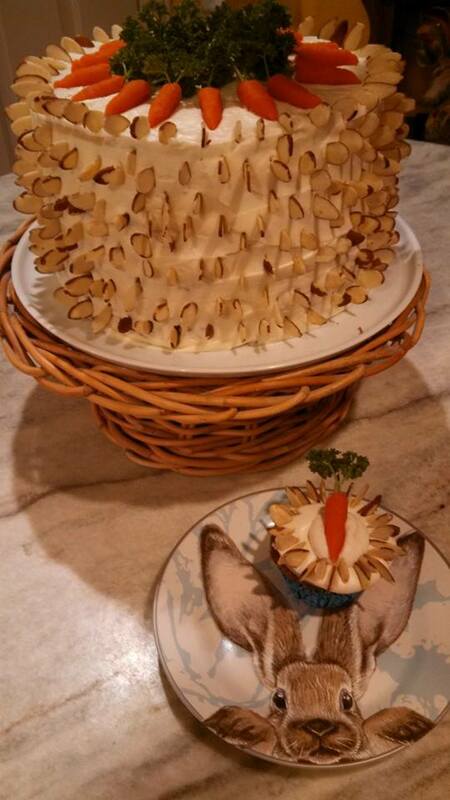 Using a apple corer, core out the center of each cupcake. 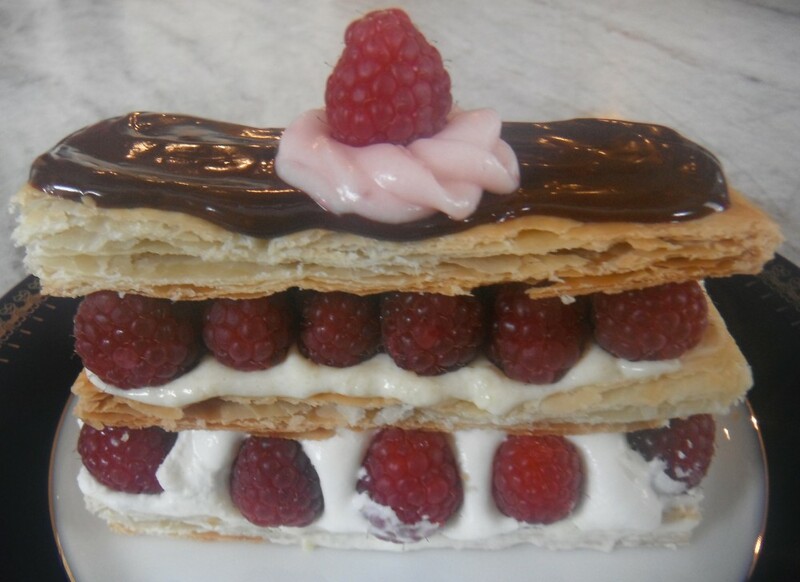 Pipe in cooled raspberry filling; set aside. In a saucepan begin to prepare lemon curd. Add the eggs, sugar, salt, lemon juice and zest to the pan and whisk until well combined. Add butter and and place over medium heat stirring constantly until mixture begins to thicken and reach 175 degrees. Do not allow mixture to boil. Remove from heat and allow to cool completely. Once cooled, pipe a small layer of curd on top of cooled filled cupcakes; set aside. In a bowl of a stand mixer add all the frosting ingredients and beat until fluffy. Place frosting in piping bag fitted with plain tip and swirl frosting on each cupcake. 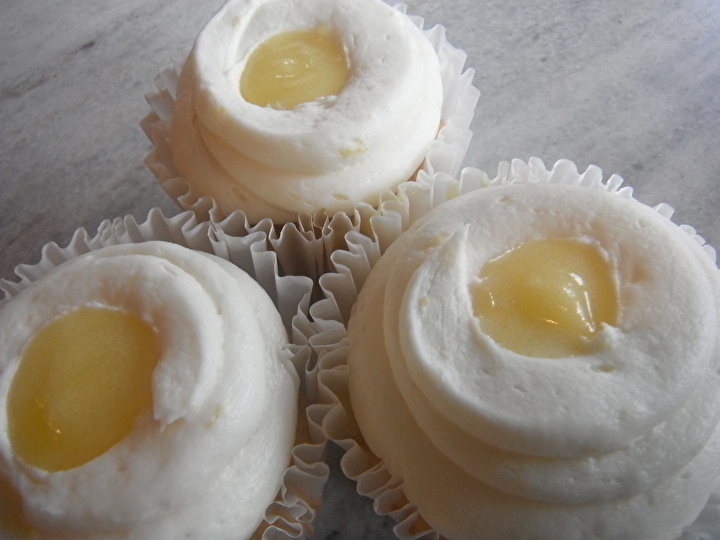 Using a small spoon make a divot on top of each frosted cupcake and place a small amount of lemon curd in the divot. Top each lemon curd divot with a fresh raspberry. Preheat oven to 350 degrees. 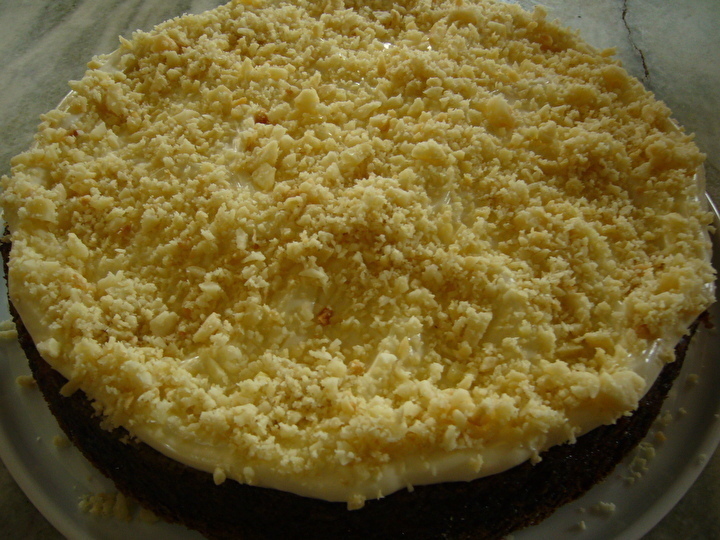 Combine dry ingredients and 1 cup finely chopped macadamia nuts. Whisk together. Mix together eggs and undrained pineapple. Combine the egg/pineapple mixture with the dry ingredients and stir until combined. Pour into a greased 9×13 pan or other pan with same volume. Bake for 40-45 minutes until toothpick inserted into center comes out clean. For the frosting combine all ingredients except the macadamia nuts and blend with electric mixer until fluffy and well combined. Frost top of cake and sprinkle on remaining nuts on top . Preheat oven to 350 degrees. Place paper liners in 24 muffin cups. In a medium bowl sift in the flour, baking powder, salt, cocoa and spices. Set aside. In a bowl of a mixer cream the butter and sugars together add the eggs one at a time until well blended. Blend in pumpkin, vanilla and fresh grated ginger. On low speed add the flour mixture in thirds and half the milk alternating, ending with the flour. Stir in the crystallized ginger. Divide equally among 24 cupcakes. Bake for 20-25 minutes or until toothpick inserted into the center comes out clean. Allow to set in pans for 5 minutes and then remove to wire rack. Allow to cool completely before frosting. Place the cream cheese and butter in mixer and blend until smooth and fluffy. Add the pumpkin puree and vanilla; blend until incorporated. Add the powdered sugar and spices a little at a time until well combined. Pipe on cooled cupcakes. Dust with a light sprinkle of cocoa powder and top with a piece of crystallized ginger. Preheat the oven to 350 degrees. Line muffin tins with about 22-24 liners; set aside. In a bowl of a stand mixer beat together the sugar and butter until light and fluffy. Add egg yolks one at a time and beat well between additions. Add the vanilla and melted chocolate and blend well. In a separate bowl sift together the flour and baking powder. Add in thirds the flour and half the milk to the butter mixture; blend just until combined. Stir in mini chocolate chips. Beat the egg whites until stiff in a separate bowl. Fold in the egg whites into the chocolate mixture. Scoop evenly 2/3 full into the liners. Bake for about 20 minutes until a toothpick comes out clean when inserted into the center. Remove from oven and allow to set for 5 minutes before removing cupcakes to cooling rack. Allow to cool completely. Combine all the ingredients and beat until blended and fluffy. Add sugar gradually until it’s the correct consistency. 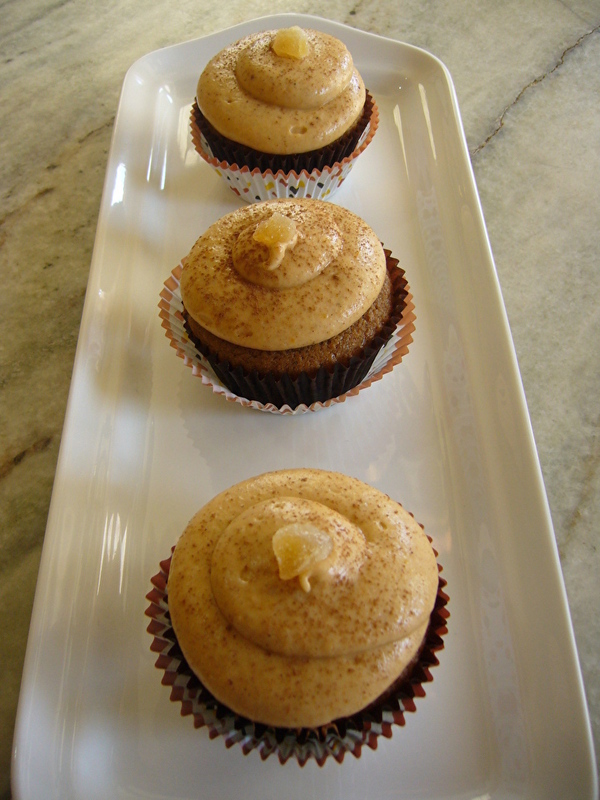 Place the frosting in a piping bag fitted with a large start tip and pipe on cooled cupcakes. Heat cream and pour over the chopped chocolate. Stir until blended completely. Place the ganache and drizzle some over the cupcakes. With the remaining ganache dip strawberries into ganache and place on parchment lined baking sheet. Place dipped strawberries in the refrigerator to allow the ganache to set up. Meanwhile melt the white chocolate. Remove from the refrigerator and drizzle the melted white chocolate over the firm dipped berries. Place back in the refrigerator to allow white chocolate to firm up . 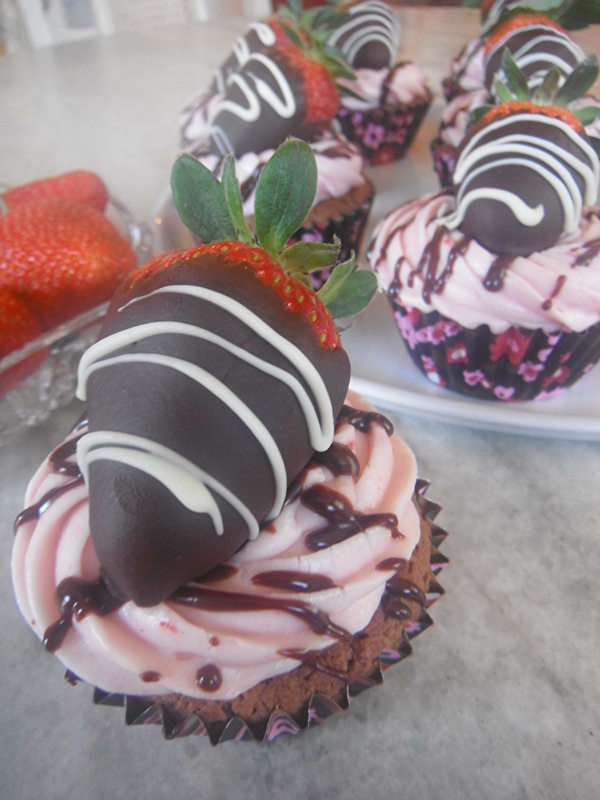 Once the chocolate coating is firm on the berries place one on each cupcake.